Amelia and Jacob must journey to the past to return to themselves. 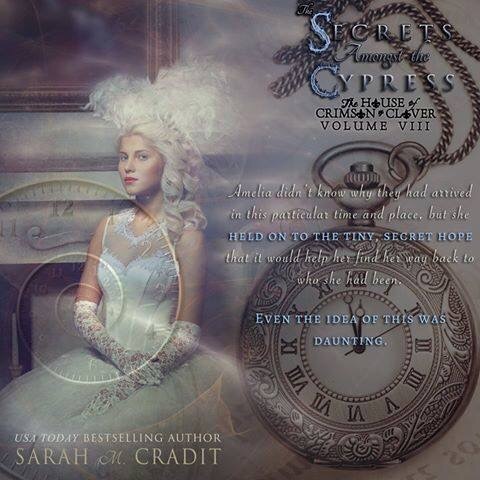 From USA Today bestselling paranormal author Sarah M. Cradit comes The Secrets Amongst the Cypress, Volume 8 in the bestselling witches family saga, The House of Crimson & Clover. Not a standalone story, Secret’s plot makes the most sense only after having the prior volumes. 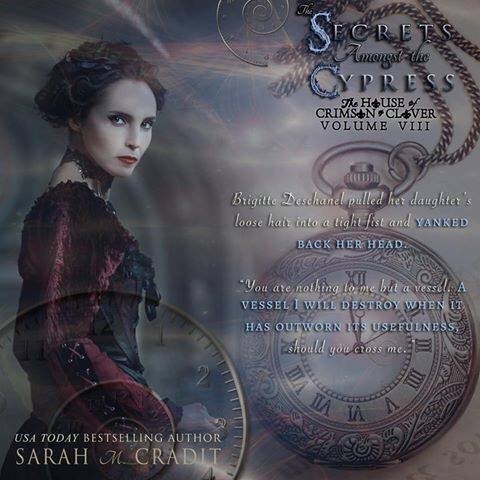 Jacob’s first experience time traveling leaves him and Amelia stranded in 1861 Louisiana on the cusp of the Civil War. With no luggage and no invitation, they find themselves at the mercy of Charles and Brigitte Deschanel, who, for now, believe they are cousins visiting from abroad. The tragic circumstances which led them to flee the present now leave them both struggling to make sense of their own individual grief. Amelia’s sorrow drives her further from Jacob, and into the strange world of an eccentric man, Victor, who knows all too much about her. Jacob’s heartache leaves him cynical and weary, losing sight of who he is and was destined to become. As the strange and terrible dynamics of the nineteenth century Deschanel family come to light, Amelia and Jacob are each drawn into the family’s complex web in myriad ways, challenging everything they held to be true. These revelations drive a deeper wedge between the couple, placing them in grave danger, from those around them… but also from themselves. The hands of time have taken hold, and the clock is ticking. The longer they stay, the greater the risk of losing everything. 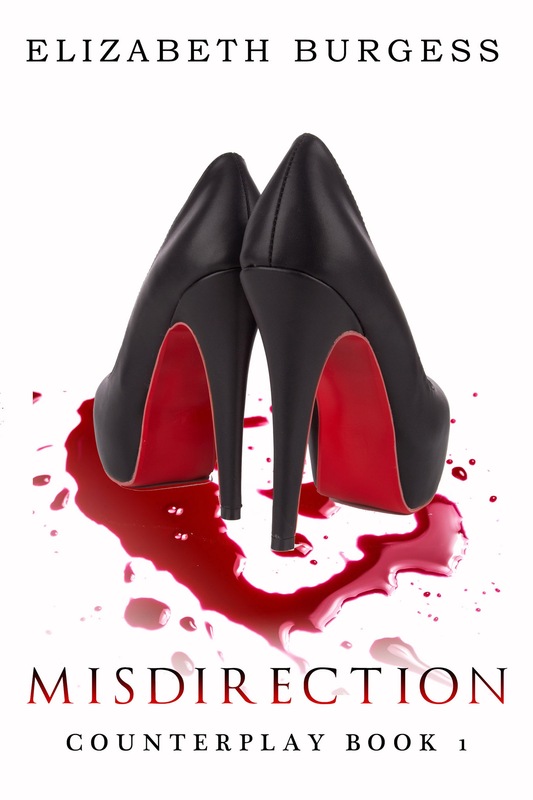 Sarah M. Cradit provides us with a fast, exciting read in the eighth novel from the House of Crimson and Clover series. 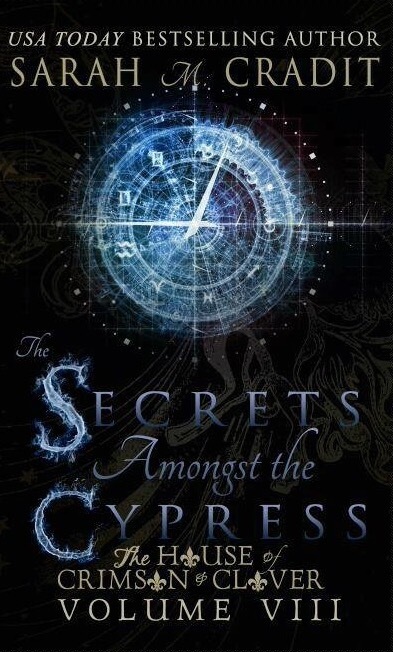 The Secrets Amongst the Cypress is different (and more poignant) than any work I’ve read by this author. The book primarily follows Amelia and Jacob as they are catapulted into the antebellum South. Fans of the series will be pleased to meet characters we’ve heard about for years (Ophelie, Bridget, Charles, Jean) and introduced to newer, mysterious characters (Victor, Marius, Charlotte). As always, it’s Cradit’s ability to reach within her characters and pull out their emotions that makes her one of the best writers out there. One special instance is Amelia and her response to a trauma she endured several books before and the care by which Cradit handles her recovery. Also noted is the realistic way her husband responds with anger, guilt, and finally acceptance and hope to move on. 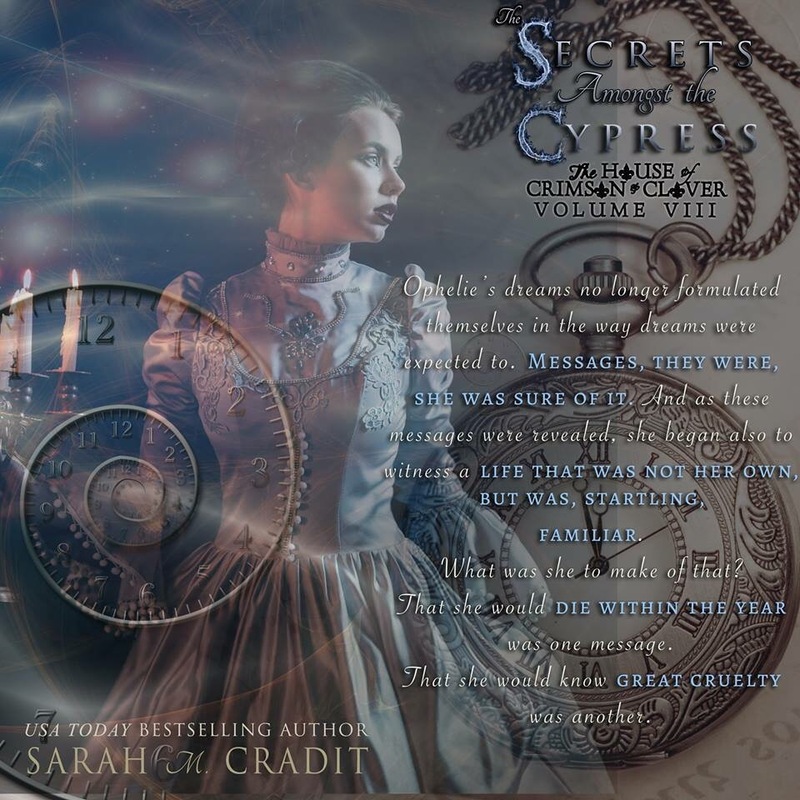 Secrets is at its heart, a story about finding truth. This novel is best understood from the beginning of the series at The Storm and the Darkness. Recommended for anyone who enjoys intricate characters and intertwined storylines with a magic flare. 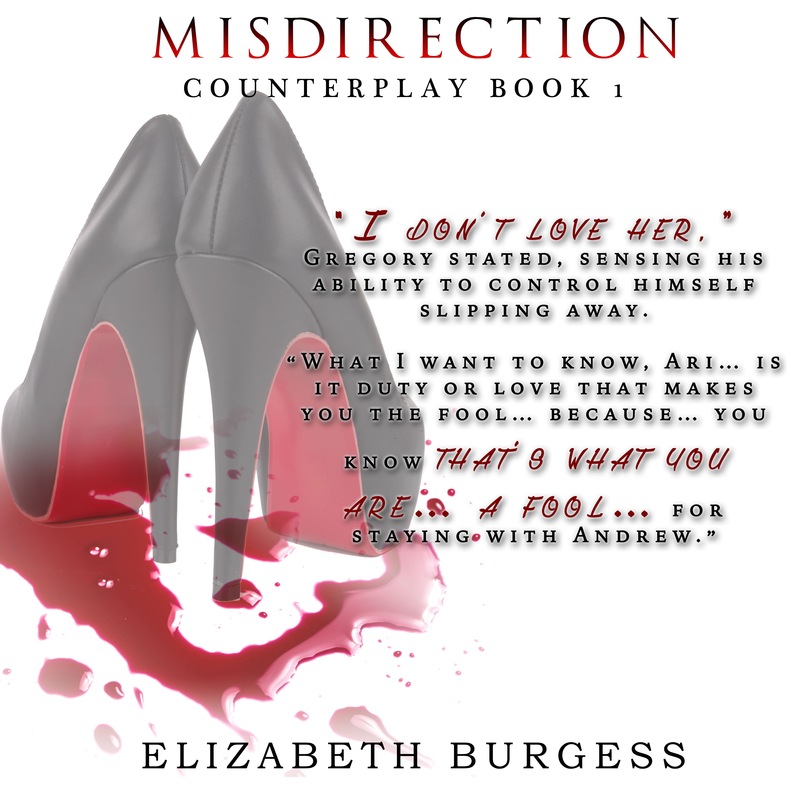 Misdirection’s live! Get it HERE. 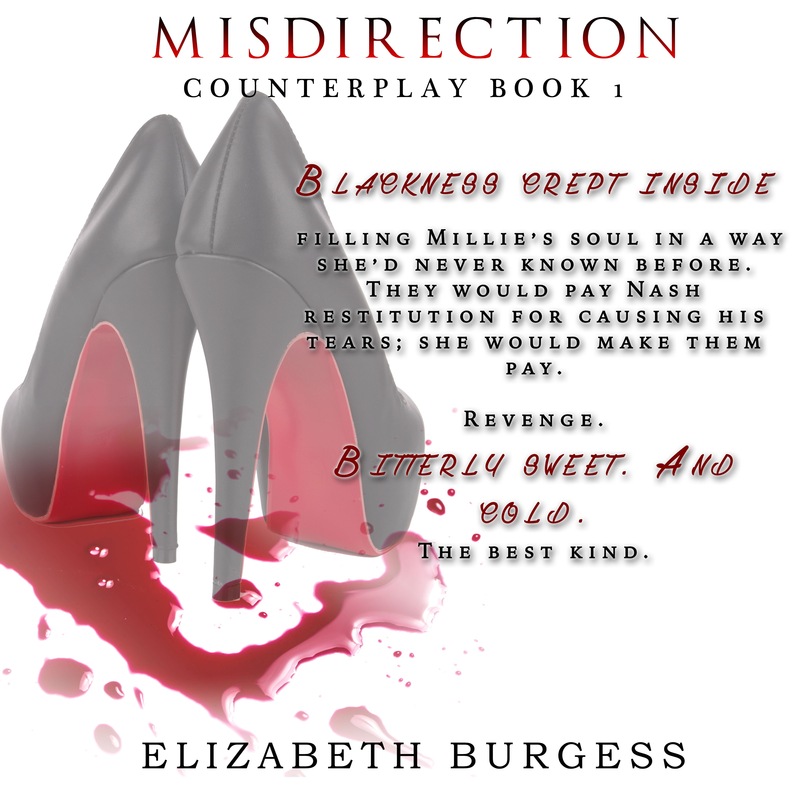 Misaligned is currently in audio production. I expect to have it ready some time in December. I’m in an November Giveaway with several great authors. Over $2000.00 in PRIZES! Enter HERE!